Mercedes Delores (Quast) Nowak, 92, of Silver Lake, died Sunday, Aug. 27, 2017, at Hutchinson Health. A Mass of Christian Burial was held Friday, Sept. 1, at Holy Family Catholic Church in Silver Lake with the Rev. Michael Doyle as the celebrant. Casket bearers were Ryan Lickfelt, Mark Lickfelt, Chad Bloomberg, Shawn McCormick, Kaitlin Young and Gerald Kucera. Interment was in the St. Adalbert Cemetery in Silver Lake. Mercedes Nowak was born Dec. 20, 1924, in Winsted, to John B. and Mary (Neumann) Quast. She was baptized and confirmed at Holy Trinity Catholic Church in Winsted. She was educated at Holy Trinity School in Winsted. On Oct. 1, 1946, Mercedes D. Quast was joined in holy marriage to Albin D. Nowak at Holy Trinity Catholic Church in Winsted. God blessed their marriage with four children, Gladys, Albin Jr., Sharon and Mary Jean. The couple operated a dairy farm southwest of Silver Lake for many years. Mr. Nowak preceded his wife in death on Nov. 28, 1992. 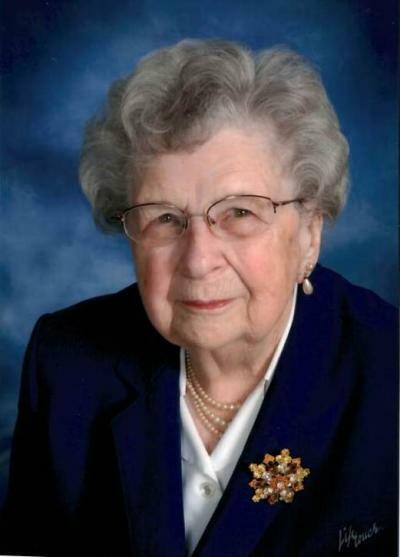 Mrs. Nowak was a faithful member of Holy Family Catholic Church in Silver Lake and its Council of Catholic Women (CCW) and its Rosary Society. She also was a member of the Silver Lake Women’s Club, Silver Lake Senior Citizens Club and the Silver Lake American Legion Auxiliary. She worked for 261⁄2 years at Telex and enjoyed craft sales. She is survived by her daughters, Gladys (Bruce) Lickfelt, Sharon Scholl and Mary Jean (Dave) Crawford; son, Albin (Sue) Nowak Jr.; 10 grandchildren; 12 great-grandchildren; brothers, Joe (Irene) Quast, John (Mary) Quast and Jim (Sharon) Quast; sister, Theresa Hance; sisters-in-law, Rosella Quast, Lorraine Quast and Mary Quast; and many other relatives and friends. The “Kolache Lady” will be missed by many! In addition to her husband, she was preceded in death by her son-in-law, Glen Scholl; her parents; infant brother, David Quast; sisters, Fidelia (Ernest) Schultz, Genevieve (Donald) Schermann, Clarine (Art) Strauss and Alma (Marvin) Ogitzak; brothers, William “Bill” Quast, Jerome Quast and Raphael Quast; and brother-in-law, Jim Hance.